The UK's third-largest supermarket chain reported a £72m loss in the year to March. The results were hit by a number of one-off costs, including a write down in the value of some of its stores. Like-for-like sales, excluding fuel, fell 1.9% as the chain faced competition from discount chains such as Lidl and Aldi. 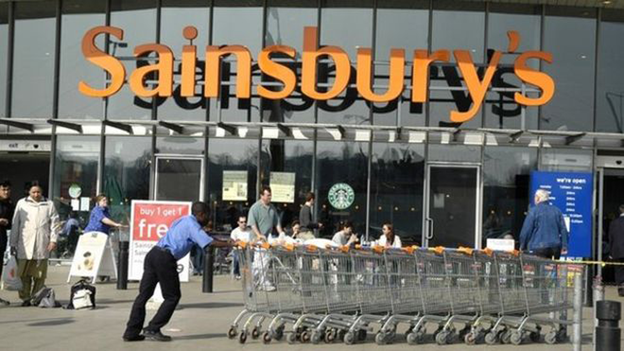 Sainsbury's share price fell 1.3% in early morning trading. In the results statement, chief executive Mike Coupe said: "The UK marketplace is changing faster than at any time in the past 30 years which has impacted our profits, like-for-like sales and market share." Despite falling fuel prices and cheaper goods generally for customers, Mr Coupe told the Today programme: "With customers having more money in their pocket, they tend to eat out rather than eating in so that has a drag on the supermarket industry."